A collaboration between the UAS Operations division at UND Aerospace and Australian-based ag technology company Bee Innovative focuses on the machine-vision-capabilities of Bee Innovative’s current drone platform, “BeeDar,” which tracks bee movements and pollination patterns in real-time and has delivered 20-percent increases in crop yields and returns for Australian farmers season to season. Image courtesy of Bee Innovative. University of North Dakota unmanned aircraft experts are now teaming up with an Australian ag-tech company Bee Innovative and its “BeeDar” technology to unlock the mysteries of honey bee flight paths to enhance pollination and optimize agricultural crop yields. In the process, the Aussie technology startup and UND are opening up an entirely new market for agricultural drones in the United States. A memorandum of understanding, signed recently on the UND campus, outlines Bee Innovative’s extensive experience in tracking honey bees in real time for precision pollination in Australia with UND’s global leadership in autonomous systems, and specifically unmanned aircraft systems (UAS). 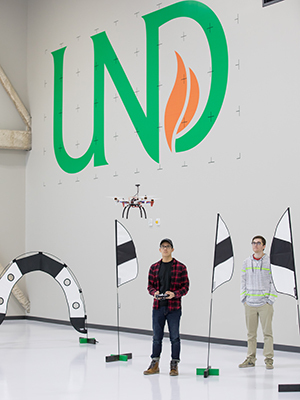 UND Aerospace, based in the John D. Odegard School of Aerospace Sciences, is the epicenter of a robust UAS ecosystem in the Red River Valley of Eastern North Dakota. Photo by Jackie Lorentz/UND Today. UND’s Aviation Program and its UAS divisions are part of the world-renowned John D. Odegard School of Aerospace Sciences. 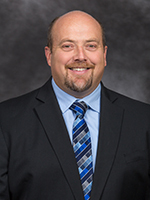 Snyder said campus UAS researchers and Bee Innovative currently are working with the UND Center for Innovation to secure more funding to conduct trials this summer in North Dakota. The Center for Innovation recently established the University Center for Autonomous Systems Innovation through a $100,000 grant from the U.S. Department of Commerce’s Economic Development Administration. The grant bolsters an already-growing UAS industry sector in North Dakota, gives UND more tools to make economic impacts across the state and around the world. Snyder said he is most excited about how UND is able to pull together experts from multiple disciplines to help solve real-world problems. 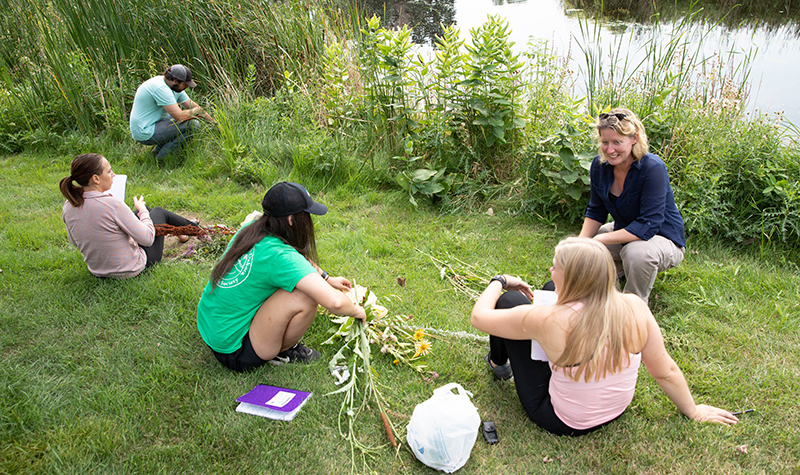 An initial proposal would link with sunflower growers in the region to tap into existing expertise from UND in UAS, Atmospheric Sciences and Earth Systems Science & Policy to further validate the Bee Innovative technology. 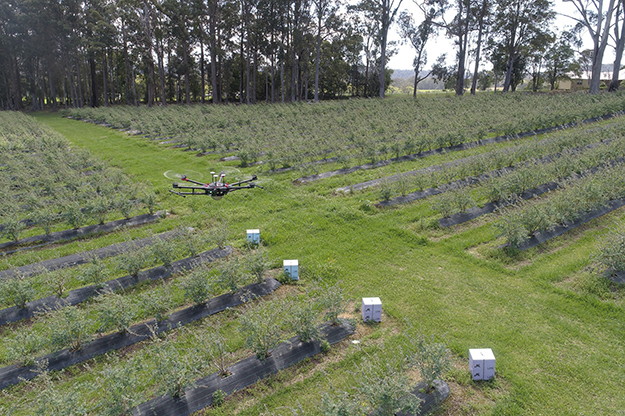 “Today’s drones are capable of autonomous flight over vast distances and have been proven to deliver greater efficiency and higher returns for farmers,” said Kate Lyall, chief technology officer and co-founder, Bee Innovative, based in Australia. 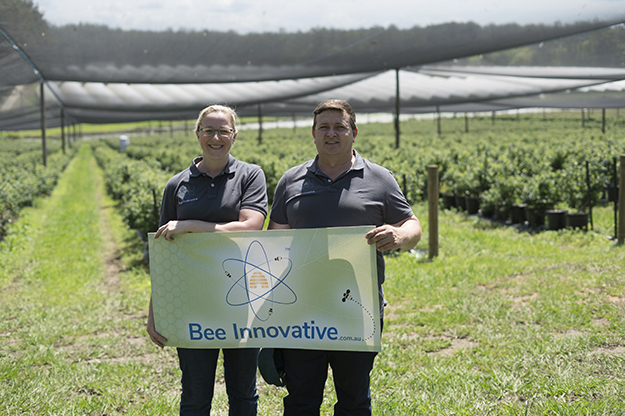 Kate Lyall, chief technology officer and co-founder of Bee Innovative; and David Lyall, the company’s CEO and fellow co-founder, stand in a field that’s protected from external elements by a vast netting system. A partnership with UND Aerospace allows Bee Innovative’s “BeeDar’ application to tap into UND’s pioneering expertise in UAS operations to address current limitations in autonomous navigation that render drones incapable of recognizing and avoiding nets and other obstacles. Image courtesy of Bee Innovative. The collaboration will focus on advancing the machine-vision-capability of Bee Innovative’s current drone platform, “BeeDar,” which is used to track bee movements and pollination patterns in real-time by Australian farmers and has delivered 20 percent increases in crop yields and returns for farmers season to season. 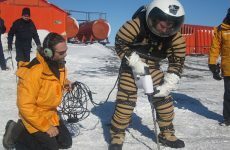 “Thirty percent of the world’s food supply comes from pollination-dependent crops, which are often grown in complex environments such as under netting or increasingly using indoor systems,” Lyall said. “As we grapple with global challenges around food security and doing more with less, any innovation that delivers increased certainty, predictability and outputs for farmers is a welcome innovation.